Lady Kitty Varney runs a discreet business to support herself and pay off her late husband’s gambling debts. 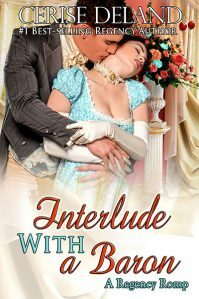 When Viscount Justin Belmont appears in her parlor, Kitty’s latest client is the very man she was forbidden to marry years ago. Kitty questions if she can find Justin a woman worthy of him…and if she can bear to help him wed any other woman. Can Kitty deny herself the chance to enjoy the charms of the man she’s never forgotten? Lady Varney’s risqué business might be her saving grace—but it may well become her undoing. Can she escape her past and embrace a future as Hugh’s duchess? Or will the man who murdered her father return to ruin her future once and for all? When Lady Varney, a proper lady of the ton, takes on a new client in her matchmaking business, she discovers he has one risqué demand. Spend the night with him! If she refuses, then she must stand aside and watch the only man she’s ever adored marry another woman. Can she surrender to one night’s temptation—and if she does, how can she live without him? Anna Fournier secludes herself, scandal staining her family name and all her prospects for anonymity, employment and even love. But one afternoon she plays her newest composition in a piano shop—and one man hears her and decides to right the wrong done her years ago. In the process, he learns to love her. Can this honorable duke—a man who fought for his country—neglect his duty, ignore his family’s wishes and marry a woman whose reputation is tarnished by the worst crime against the land he loves? Sophia di Contini sailed to England with one burning objective—to find her family’s precious art stolen by the Bonapartes. When Victor Cameron discovers her sneaking into his study, he’s shocked at her appearance and silently curses his undying desire for her. But he cannot refuse her his help. Together, they learn that the past can be forgiven and that love is the most priceless treasure of all.